There’s been a recent increase in popularity of Internet of Things, DIY boards and entry-level devices. The consequence has been a step back from writing large apps in favor of smaller ones. ProGuard is here help keep apps as small as can be. Smaller apps download, install and run faster. This is important for business. The more time spent onboarding, the higher the chance the user is going to abandon your app and try something else. 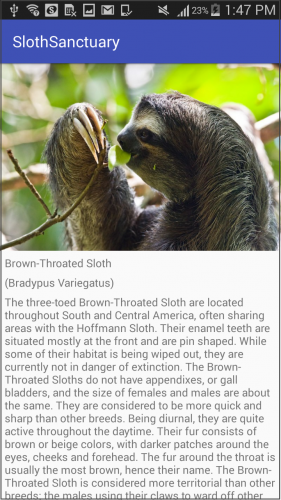 In this tutorial, you’ll create a simple app which reveals details about sloths! You’ll learn how to strip down your app size by making use of ProGuard – an app shrinking and obfuscation tool. The optimizations that ProGuard performs translate to a certain level of obfuscation, which can add a minimal layer of security to help prevent reverse engineering or tampering with your app. Note: This tutorial assumes that you’re already familiar with the basics of Android development and Android Studio. If Android development is new to you, first read through our Beginning Android Development and Kotlin for Android tutorials. Download and unzip the materials for this tutorial using the Download Materials button at the top or bottom of this page. Open the starter project in Android Studio 3.1.4 or greater, then build and run to see the app you’ll be working with. The APK Analyzer is a tool for inspecting your finalized app and what contributes to it’s size. 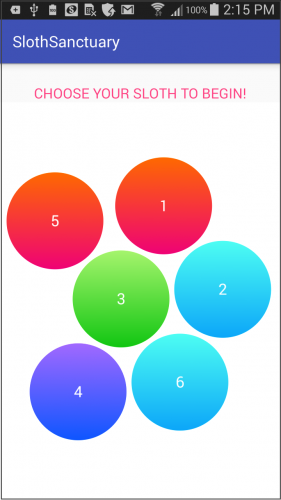 It presents a view with a breakdown of your app’s file size. You can see what’s taking up the most space, as well as the total method and reference counts. Launch the analyzer by selecting Build ▸ Analyze APK. It will open a dialog for your filesystem. If necessary, navigate to the debug folder SlothSanctuary-Starter/app/build/outputs/apk/debug. Select the app-debug.apk file and click OK to open the APK Analyzer. Note the file size of the current APK. You’ll use this tool several more times in this tutorial. Note: There are many other tools that engineers use to analyze apps, such as JD-GUI, APKTool, and Jadx. Some of these tools help reverse engineers decompile the app back to its original code. Sometimes it’s done for fun, but often reverse engineering is done for theft of intellectual property or app cloning. Perform a Gradle sync, then select Build ▸ Make Project. Once finished, run the APK Analyzer again. You’ll notice adding the dependency added a few megabytes to the APK file without even writing any code! You won’t be using every part of this library – this is where ProGuard comes in. ProGuard will do its job to remove all the code that is not accessed by the app. Setting minifyEnabled to true enables ProGuard. ProGuard looks at the entry points of your app and maps out the code that the app can reach. It removes the rest, and replaces the names of classes and methods with shorter ones, making for a much smaller APK size! Be aware that using ProGuard results in slower build times. The compiler errors include “Can’t find referenced class org.sl4j” and “Can’t find referenced class sun.misc.Unsafe”. The first way you’ll look to solving these ProGuard problems is through online research. 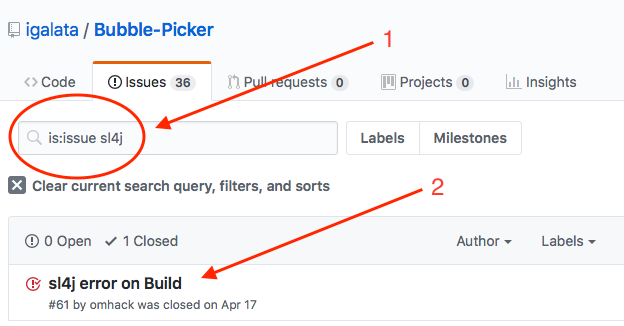 Head over to Bubble Picker library’s GitHub page to see if there’s any documentation about using the library with ProGuard. Sometimes the README page will have ProGuard information, but in this case it doesn’t. Next, select Issues. In the search field, remove the is:open, add sl4j and press enter. Good luck – issue #61 looks like the same issue, with suggestions to add some “don’t warn” exceptions for ProGuard. “Don’t warn” rules tell Android Studio to ignore warnings. This can be dangerous, but if you know for sure that you’re not using a part of the code, it can come in handy. They work by specifying the package name. * is a wildcard – it doesn’t include sub-packages, whereas ** includes sub-packages. The rules for ProGuard go into the proguard-rules.pro file. Select Build ▸ Make Project. Now it builds successfully! Note: You may see suggestions for “-dontwarn *” floating around on forums, but it’s very bad practice. This means don’t warn “all”. It will fix irrelevant warnings, but will also ignore critical ones where something is actually wrong. Run your APK Analyzer again. You’ll notice the APK size is much smaller now. That’s because ProGuard has removed all of the code you’re not using. Now that your project builds, you can start to add in code to display the bubbles. Note: This tutorial assumes you’re familiar with handling imports. If you don’t have on-the-fly imports set up, import by pressing option + return on a Mac or Alt + Enter on a PC while your cursor is over the item that needs to be imported. You are overriding totalCount to tell the BubblePicker how many bubbles there will be. You’re overriding getItem() to return a customized PickerItem. You set up the BubblePickerListener to handle selecting a bubble. Build and run the app. Uh oh — the app crashes with a NullPointerException! Note that several methods in your stack trace are obfuscated – the names are changed and minified. This is one of the key features of ProGuard. Check the output log to narrow down what the problem is. You can see in the Run tab that it has something to do with “GL” and “onDrawFrame” in the BubblePicker library. Note: It’s always good practice to add sufficient logging in your catch statements, nullability checks and error states. With ProGuard, this is crucial – in the event of a problem, it will help lead you or other developers to the root of the issue, especially when the method names in stack traces are obfuscated. usage.txt – Lists code that ProGuard removed. dump.txt – Describes the structure of the class files in your APK. seeds.txt – Lists the classes and members that were not obfuscated. Good to verify that you have obfuscated your important files. mapping.txt – The file that maps the obfuscated names back to the original. You can use the mapping file to find the culprit of the crash. At first, it’s not clear what the directories are. 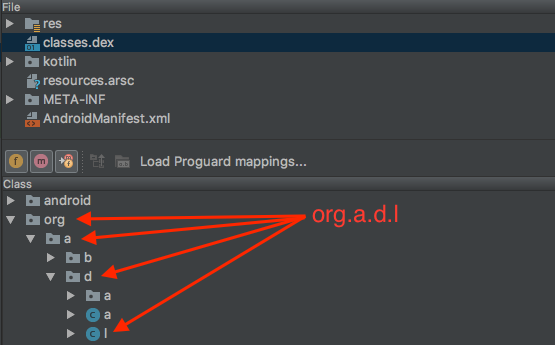 Click the Load Proguard mappings… button to map the obfuscated names back to the original. Select the mapping.txt file in the debug folder and click OK.
Toggle the Deobfuscate names button to the left of the Change ProGuard mappings… button to switch between obfuscated and deobfuscated code. You can trace the problem down to the jbox2d library. You need to preserve jbox2d so that ProGuard doesn’t muck with it. Every time you make a release build, the mapping.txt file is rewritten. That means you must save each copy with each release of your app. That way, when you receive an obfuscated stack trace for a particular app release, it will be useful. You can upload your mapping.txt file to Google Play to deobfuscate your crash stack traces. If you’re using Fabric, a deployment and crash reporting tool from Google, instructions for uploading your mapping.txt file are here. keep – Preserve entire class and class members. keepclassmembers – Preserve the class members. keepclasseswithmembers – Preserve all classes that have a specified member. ProGuard rules are written in a specific template format. It’s best practice to use explicit keep rules, rather than keeping the entire class. Instead of preserving the entire BubblePicker library, you only need to keep org.jbox2d and its sub-packages. The format is the same as the dontwarn rules. Inside the curly braces, you told ProGuard to match any method name. Build and run the app. When your app loads up, you should see the bubbles floating around on the screen. Note: If you’re sharing your code, write keep rules as you write your code and be sure to publish them on your site or GitHub README page so other developers can easily use your code without any problems. Now you’ll set up some real sloth data. There’s a file included in the res folder of the project called sloths.xml. Since it’s in XML format, you’ll need a way to get that data into Kotlin objects. You’ll use another third party library included with the Retrofit package called SimpleXML. Sync Gradle, then build and run the app. You’ll have some new warnings: a reference to org.codehaus.mojo.animal_sniffer.IgnoreJRERequirement, and many variations of warnings about javax.xml.stream.**. Select Build ▸ Make Project. This time the build should succeed. You removed the explicit return type for the function. You opened the sloths XML file an an InputStream. 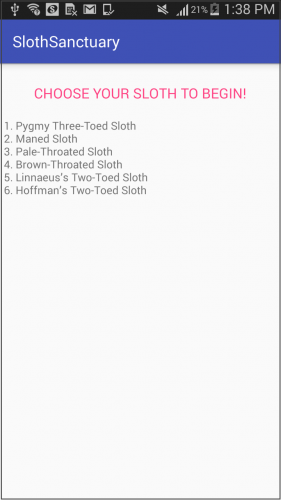 You retrieved a list of Sloths by invoking read(). This tells the parser to look for the root node called “sloths”. @field and @param let the parser know to look for “sloth” items. Build and run the app. Notice the NoSuchMethodException crash. You know it must be the code you just added. Doing similar debugging to what you did earlier, you can narrow the problem down to the Parameter object inside SimpleXML. This time you’ll take a deeper look at the problem. SimpleXML works by loading XML entities presented at runtime, then instantiates Kotlin counterparts. Kotlin can only do this by using introspection and reflection. Sloths hang out in trees for hours and hours, not seeming to do very much. It’s probably because they’re busy introspecting and reflecting on life. In Kotlin, introspection and reflection are features of the language that inspect objects and call methods dynamically at runtime. ProGuard looks at the static version of your app, but doesn’t actually run your app, so it cannot know which methods are reachable using introspection and reflection. Remember that ProGuard takes long class names and replaces them with smaller names. If something tries to reference a name at runtime with a constant string, the name will have changed. You can often tell this is happening with the NoSuchMethodException. Build and run the app. You should see the bubbles populated with the different species of sloths. Tap on a bubble to reveal more information about each species. Congratulations! You’ve set up a cool looking app using the default ProGuard settings. You could stop here, but if you’re interested in how the app size can be further reduced, continue reading. ProGuard provides an advanced optimization profile. It’s not used as the default because it can cause further build and runtime errors. You’ll enable the advanced optimizations by swapping the default proguard-android.txt file out with proguard-android-optimize.txt. Sync Gradle, then build and run the app. The build time will be much longer because ProGuard is performing more analysis and optimizations inside and across methods. It will seem very slow, much like a sloth climbing a tree. This time, the error mentions a constructor instead of a missing class, which is why this code uses keepclassmembers to keep class members only. Build and run the app. You should see your app back up and running again. Note: This might be a good time to stop and check the APK Analyzer again to see how the size is doing. You’ve set up a fancy ProGuard optimized app for your Sloth Sanctuary. The Sleuth Zoo is very competitive – they’ve been taking all your ideas and making a profit off of them. How evil! You think that when you release your app, they’re going to analyze your APK and steal your “secret sauce”. Since ProGuard performs obfuscation, this is yet another place that it can help you out. Sloths hide themselves at the tops of trees to prevent predators finding them from below. Many have a symbiotic relationship with green algae. It grows on their backs so that they blend in with the green leaves. This tricks eagles and other flying predators. 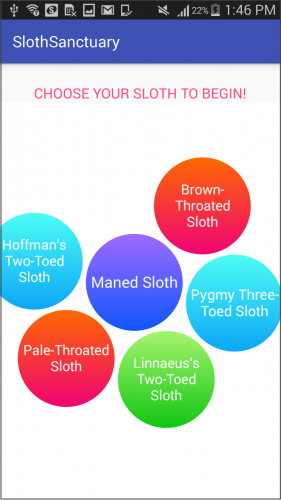 Sloths obfuscate themselves, which really comes down to trickery and hiding. Obfuscation is not encryption. Throwing ProGuard on your release can deter the casual attacker to move on. However, it’s not a substitute for proper security measures. You should never store sensitive API keys, tokens or passwords anywhere in the APK. Instead, have those items sent to the app encrypted upon authentication. That being said, obfuscation is sometimes used to hide or obscure proprietary logic or a secret algorithm. Sometimes developers apply manual obfuscation. Some examples are string splitting, dummy code, disguising the names of methods, or using reflection to muddy the app flow. You’ll add some reflection code that obfuscates your secret bubble-gradient formula. As of right now, it’s not impossible for an attacker to find the numbers used to make the gradient. 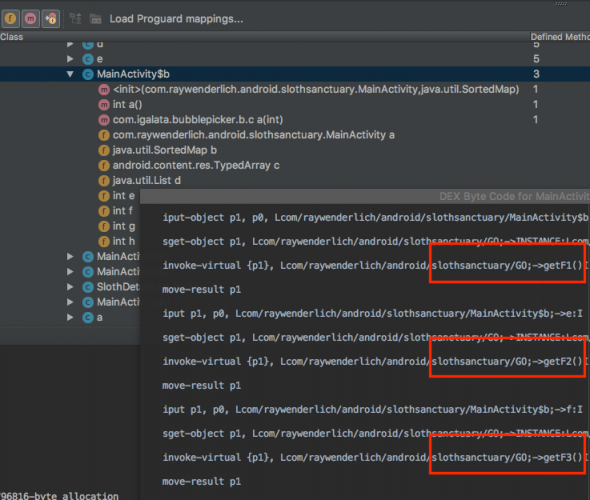 In the APK Analyzer, select the classes.dex file. Navigate to com ▸ raywenderlich ▸ android ▸ slothsanctuary. Right-click on MainActivity$b and choose Show Bytecode. Integers e, f and g are the multiplier, modulus and addition variables of 2, 8 and 1 you added earlier. 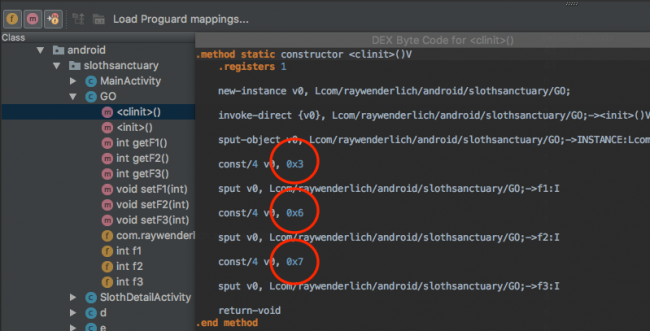 When Android Studio compiles your app, it puts the code into that classes.dex DEX (Dalvik Executable) file. DEX files contain Bytecode – an intermediary set of instructions that a Java Virtual Machine (JVM) runs or ART (The Android Runtime) later converts to native code. With this being exposed, an attacker could potentially see values that your variables hold! Under the hood, Kotlin classes contain metadata about an object. You’ll need to keep that metadata in order to use reflection. Open the BN.kt file. Notice the class was manually obfuscated by abbreviating the class name and methods. The comments explain each abbreviation. Comments don’t make it into the APK. Wait, what? What is this magic? Gets the Kotlin class for the ownerClassName string provided. Instantiates that class at runtime if not already instantiated. Dynamically gets the property referred to by fieldName for the instantiated class. Calls a setter on that property, passing in value. The real magic happens when the app invokes sn() (setupNumbers), which looks for the com.raywenderlich.android.slothsanctuary.GO class. It finds the fields named f1–f3 and swaps the values out for something else at runtime. Note: Sometimes attackers also reverse engineer apps in hopes of patching or hooking security checks out of the code. A good example is when a feature is only available with a paid subscription or after a user achieves a level in a game. It’s recommended to do those types of checks on a server. ProGuard can still help by obfuscating the code that makes the request to the server. This is an example of using the Kotlin reflection library to call methods by name, but now ProGuard is changing those names. Build and run the app to get the ClassNotFoundException once again. You can use keep rules again to preserve the class, but this time around you’ll do it by using @Keep annotations. With the Annotations Support Library, you can add @Keep to methods and classes you want to preserve. This is a great feature because it acts like documentation. 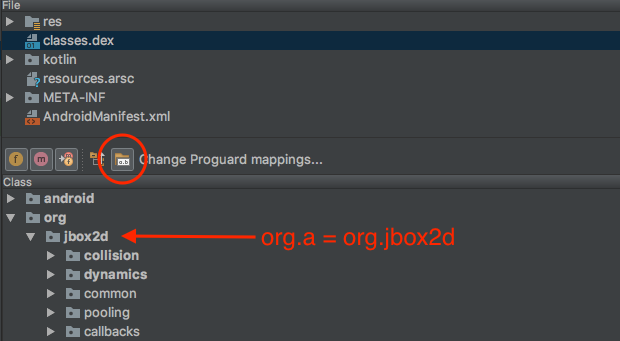 The ProGuard information sits above your method as opposed to being in a separate file. Adding @Keep on a class will preserve the entire class. Adding @Keep on a method or field will keep the name of the method or field as-is. In the BN.kt file, add a @Keep annotation to the top of the GO object. Even if you follow those methods to the GO companion object, the numbers that are apparently returned are not the real ones. You tricked em! You’re becoming a pro at ProGuard! You survived a crash course on ProGuard. Download the final project using the Download Materials button at the top or bottom of this tutorial. You looked at how ProGuard has problems with reflection. ProGuard also has issues when you call a method from JNI (Java Native Interface). If you’re working with JNI, check out solutions in the JNI training article. An Android Library (AAR) is able to make use of a transparent method that retrieves published keep rules automatically. See consumerProguardFiles on how to take advantage of this. The makers of ProGuard, GuardSquare, have a commercial solution called DexGuard. It offers more protection than obfuscation. DexGuard encrypts the classes and strings as well as assets and resource files. It also provides app integrity checking and certificate pinning. 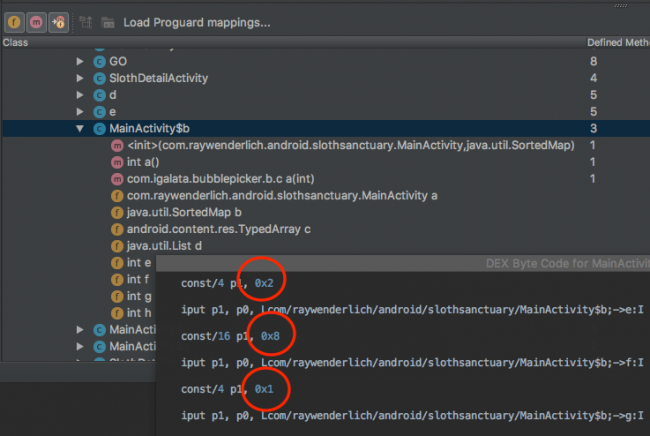 While Android Studio comes with ProGuard built in, Google has been developing R8, which aims to be a drop-in replacement. It’s a new code shrinking and obfuscation tool that could replace ProGuard in the future. Check out Google’s R8 page for more information.